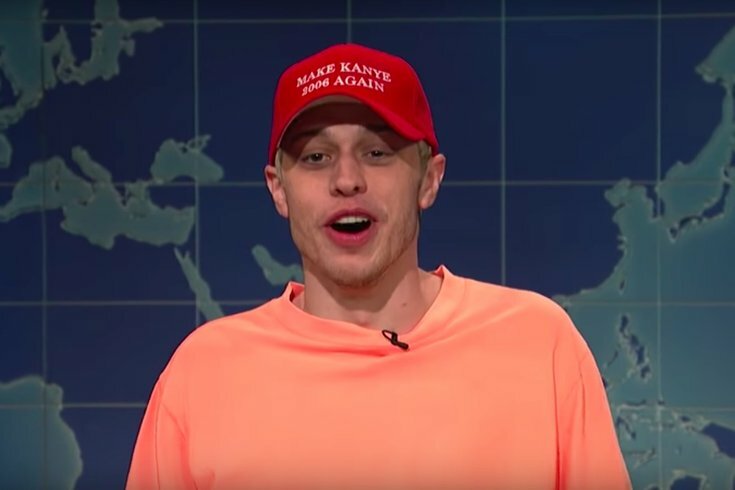 Pete Davidson wants to "Make Kanye 2006 Again" after the rapper's pro-Trump rant on "Saturday Night Live." After a season premiere marked mostly by Kanye West's odd performances and awkward pro-Trump rant, "Saturday Night Live" returned last night with host Awkwafina and musical guest Travis Scott. The show began just a few hours after news broke of Brett Kavanaugh being confirmed to the United States Supreme Court. The show's cold open reflected the news, showing the Republican locker room celebrating. Beck Bennett is a spot-on Senator Mitch McConnell and Kate McKinnon returns as Senator Lindsey Graham. Awkwafina, rapper and breakout star from "Crazy Rich Asians," made her hosting debut and gave a nod to Lucy Liu for being the first Asian-American woman to host the show 18 years ago. One of the show's best highlights came during Weekend Update, when Pete Davidson joined Colin Jost and Michael Che at the desk to address the madness of Kanye West's appearance on the show last week. Need a refresher on that? After musical performances that included him dressed as a bottle of Perrier, the artist went on a pro-Trump rant during the credits, awkwardly holding the cast hostage on stage until he was through. See our re-cap on last week's episode here. The main message of Davidson's address: "Being mentally ill is not an excuse to act like a jackass." Since West's "SNL" appearance, his comments regarding the 13th amendment of the U.S. Consitution have faced greater scrutiny as footage of him after "SNL" was shared. Saturday night it appeared West deleted his social media accounts, including Twitter and Instagram. This is not his first hiatus from social media -- until last April he had been off those sites for about a year. Travis Scott was this week's musical guest, and his performance was full of cameos. Tame Impala, John Mayer, and producer Mike Dean all appeared on stage during a medley of "Skeletons" and "Astrothunder." Next week "SNL" returns with host Seth Meyers and musical guest Paul Simon.